The arts are for everyone. They are connective and interactive - they interpret, represent, and question social norms, world history, science, and the humanities. In the broadest scope, the arts are visual communication, often evoking emotions, sometimes forcing one to question their values and views, and other times eliciting simple enjoyment and an escape from reality. The School of the Arts at KU strives to provide students with opportunities to discover and create. We give students tools for later in life, while challenging them to take risks by expressing themselves publicly in a myriad of ways. Students learn to cross boundaries, to reflect on the world, and are pushed to the limits of their imagination and creativity. The Arts are a visible expression of society and culture, one that transcends global boundaries. They are often a theatre for social change and engagement. 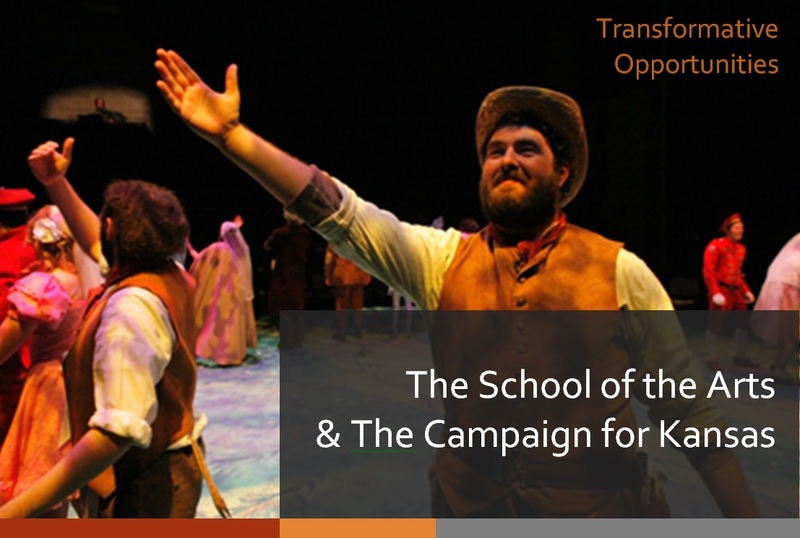 The School of the Arts has five shared priorities and a big common goal for fundraising during the Campaign for Kansas: (1) Undergraduate scholarships; (2) graduate fellowships; (3) internships and other professional development opportunities for students; (4) funds for guest artists and residencies; (5) support for faculty research, and (Big Goal) funding for the construction of a 300 - 500 seat performance facility where dance and theatre can be presented, where visual artists can perform and install new multimedia work, and films can be screened. Finally, a grand challenge: The Department of Film and Media Studies must secure funding to replace the inadequate and aging Oldfather Studios with a facility reflective of contemporary film making processes and teaching practices. Please visit with KU Endowment for more information on giving opportunities in the School of the Arts.